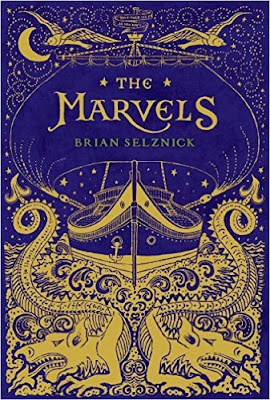 Brian Selznick's books represent a masterful new art form. They are hybrids of middle reader and picture book, but more cinematic than most picture books. They zoom in on details in frame after frame, giving a sense of emotional and narrative flow. I love how he keeps the visuals and text separate so that the reader can focus on each in its own strength. As someone who is not used to paying much attention to pictures, Selznick's layout forces me to do so. His latest, The Marvels, is a story built within a story. The Marvels are a family of adventurers, actors, and artists introduced to us through a series of pictures from 1766 to 1900. Then the story shifts to text of a boy, Joseph, in 1990, who has run away from his boarding school to stay with a mysterious uncle whom he has never met. There is some relationship between Joseph and the Marvels, but for most of the book, it remains a mystery just exactly what this relationship is. Selznick does an amazing job of bringing to life a real person who curated his house into what he calls a "three-dimensional historical novel." Everything in the house could easily be found in the eighteenth century, lighted by candles and fire rather than electricity. Each room seems to be habituated by a family that has just left the room. Objects remain behind, telling the story of what the family was doing, whether it be a half-eaten scone or a napkin tossed on the floor. The descriptions inspire me to treat the objects in my house with more intentionality. There's a passage I just love in the afterward where Selznick describes interviewing a man connected to the house on which the story was based. While chatting, the man polished a table with such care that Selznick said it was one of the most beautiful things he had ever seen. This brought tears to my eyes. This attention to and care of objects is why this book is a cure for negligence. Perhaps you have overlooked your table, your dishes, your meal. This book will encourage you not to. You never know what life has been or will be emitted from each thing you encounter. The book itself is amazing as an object just like the objects cherished within the story. It's 665 gilt-edged pages encased in hard-cover are apropos to this labor of love. It's difficult for a book-collector to refrain from adding this handsome artwork to their shelves.